You know I have a lot of WIPs, you know this. 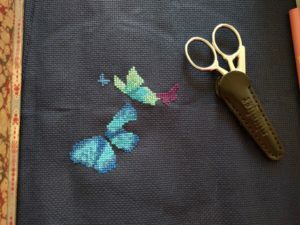 I got a pretty kit for xmas and I thought it would be fun to do a butterfly a day, then backstitch/specialty stitch for 15 minutes a day. I bet I can finish this whole thing in a month! It’s Dimensions 6846 Exotic Butterflies. 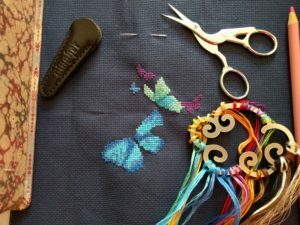 I did 3 of them during xmas break, the big one yesterday (that’s the second biggest in the group, so it should be pretty easy to do one a day!) and the little purple guy this morning. And oh, that cloud thread holder makes my day every time I see it! I got it on etsy here.